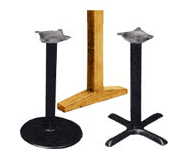 Cast Iron table bases, maple table base, oak supports, t-shaped legs, h-shaped legs, x-shaped table base, support cylinders, angle brackets, support posts, bar supports, by John Boos, Durable & Hafele. 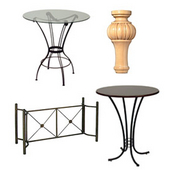 John Boos table tops and table bases come in a wide variety of sizes and styles. 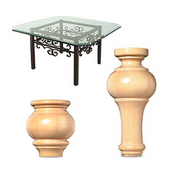 Choose from Lyptus, Red Oak or Hard Maple table tops in six different models including round, square, rectangular, oval, round drop-leaf and octagonal. 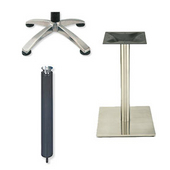 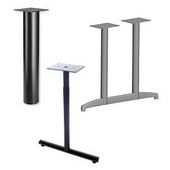 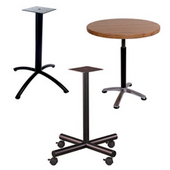 Table tops 42" and under feature a Tuff-Var semi-gloss protective finish to prevent scuffing. 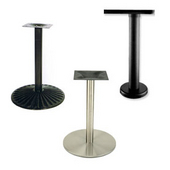 For table tops 48" and larger, a standard protective finish is applied.